The music on this CD was recorded live in concerts during the bandâ€™sÂ 2005/6 concert series. It is inevitable in a live recording that there is background noise, coughing, talking and the odd dropped objects from the audience and unfortunately wrong notes from the band, however the bonus is that the recording shows the enjoyment the musicians feel when playing music. This really shows during the playing of the cornet trio, â€˜Music for a Silent Movieâ€™, when the listener can clearly hear the band membersâ€™ excitement describing, through the music, those far off days of the silent movies â€“ Charlie Chaplin, Buster Keaton and the Keystone Cops. (Listen out for the police bell). We hope you will enjoy this live performance given by a group of excellent musicians who receive no pay or expenses, their only reward is that the listener likes what they hear. 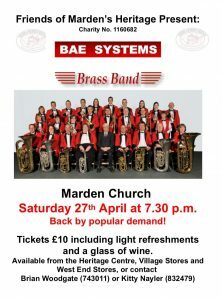 BAE SYSTEMS Brass Band, based in Rochester Kent, has played in concert halls throughout Southern England as well as travelling on the continent performing concerts in Holland, Belgium, France and Germany. This hardworking and busy ensemble has performed in many prestigious venues, London West End hotels, Farnborough Air Show and Portsmouthâ€™s Festival of the Sea to name but a few. The band regularly enters brass band contests and has represented the southern counties in national competitions.